The upcoming issue of Imagine Magazine is going to focus on online gaming and role-playing games, so I was pumped when they approached me to see if I was interested in contributing again to their magazine. After all, for all my readers out there, you know that I’m a WoW player, and the prompt they gave me was about how to game safely. Which is why I’m sharing the article here with you, my fellow teachers and parents. In it, I talk a little about why I think online role-playing games are appropriate for this generation. 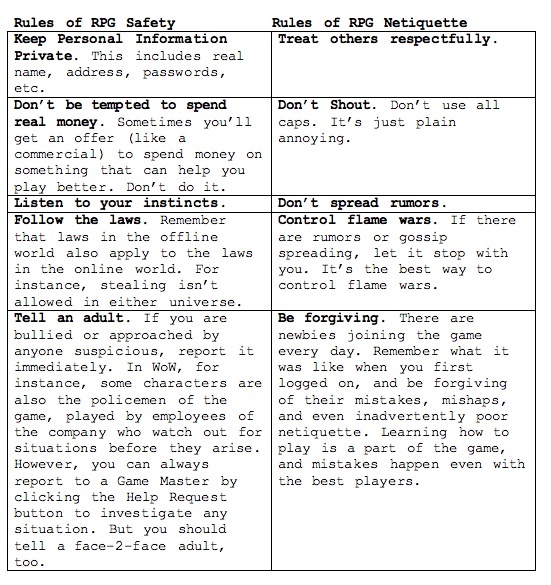 I also give a concise lists of Rules for RPG Safety and Rules for RPG Netiquette that I thought you might like to pass on to any student you know who plays any social online game. For readers who may not know too much about online RPGs, they work like this: the minute you log on to play, you enter the story, as it exists in real time. The narrative you ride is like the moving walkway in an airport. You login and begin your own storyline and along the way you get to meet other characters, and behind each character is another person, somewhere, sitting and playing their own narrative. You speak to each other in caption bubbles, like a comic book. You talk about the game, about real life, about strategies. My name is Heather Wolpert-Gawron. I am a teacher and blogger who, once my toddler is asleep, plays World of Warcraft with my husband. Yes, it’s true. I’m a teacher who plays WoW. Role Playing Games, or RPGs, have been around for a long time. It all began with Dungeons & Dragons, a dice-rolling game played with a small group of players who had created characters with each roll and battle. Back then, you would scout for like-minded adventurers at school or in the neighborhood. But now, gamers play in huge numbers, in online universes, 24 hours a day, across multiple time zones. RPGs have become Massively Multiplayer Online Role Playing Games, or MMORPGs. World of Warcraft is an MMORPG that functions on a ginormous scale: The number of people who currently play WoW is greater than the entire population of Greece. The enormity of MMORPGs means you don’t have to struggle to seek out like-minded people like some of us did in the days of D & D RPG yore. But it also means that you are exposed to many more people than before. Online RPGs are a gift to this generation and unlike any games that came before them. That you and your friends in America can lay siege to a castle with an allied group from Korea is remarkable. That my middle school Mock Trial team in Los Angeles could join a fellowship of Harvard Law Students in Boston and discuss both law and Hit Points is equally remarkable. And you’re here, in this generation, to enjoy it. But don’t abuse the privilege. Let your character be one that others want on their side. Have fun, adventure safely, and follow the rules of both the game and life.